This Sausage Ricotta Pasta is easy, fun and perfect for the season! I made this dish because my husband loves ricotta cheese and I wanted to make him something he’d like for dinners while I was out of town last week. It worked! He thought it was great. 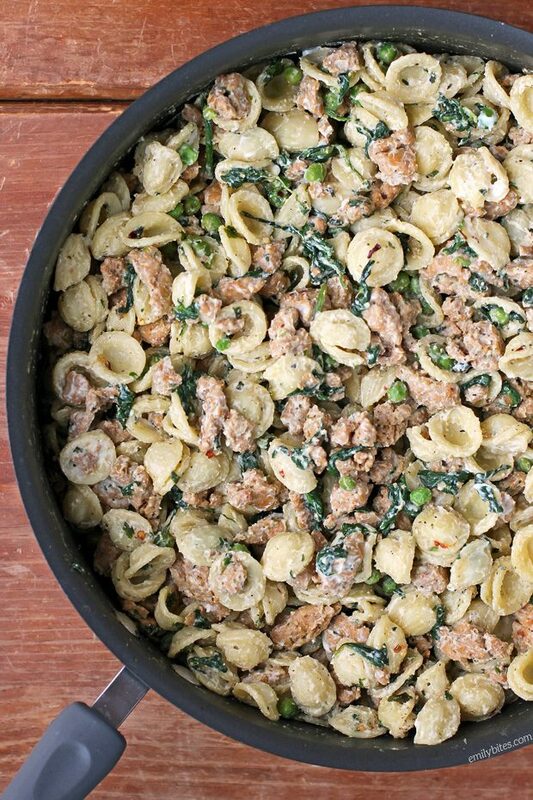 Spicy sausage, sweet peas, healthy spinach, bright lemon, creamy ricotta and hearty pasta make for a super satisfying meal. Plus this Sausage Ricotta Pasta comes together easily and is only 297 calories or 7 Weight Watchers SmartPoints per serving! Looking for more lightened up pasta options? Check out the pasta section of my recipe index for favorites like Beef Stroganoff, Beefy American Goulash, Slow Cooker Kickin’ Chicken Pasta, Beef and Sausage Manicotti, Pumpkin Alfredo Tortellini Skillet, Spinach and Artichoke Lasagna Roll Ups, Chicken Cordon Bleu Pasta Bake, Tomato Soup Mac & Cheese, Spaghetti Pie, Sausage Tortellini Skillet, Buffalo Chicken Lasagna Roll Ups, Chicken Parmesan Stuffed Shells, Spicy Sausage Pasta and many more! 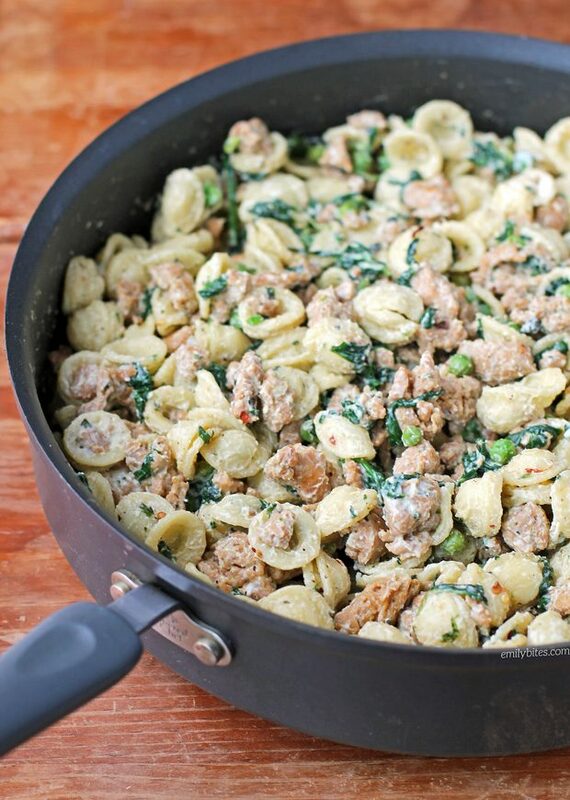 While pasta is cooking, bring a large walled skillet or saute pan over medium heat and add the sausage. Cook, breaking it up with a wooden spoon, until the sausage is cooked through and broken into small/bite-sized pieces. Add the minced garlic and continue to cook for another minute until fragrant. Add the spinach, peas, basil and pepper and stir until combined. Cook, stirring occasionally, for a few minutes until the spinach is wilted and the peas are warm. Add the cooked pasta from step one and stir together. Add the lemon juice and ricotta cheese and stir until well combined. Oh Emily this sounds yum yum!! Definitely going to make it this week. I’m just wondering, if I don’t have fresh spinach, maybe I could use frozen?? I might give it a try – what do you think?? Made this the other night on a cool, rainy night – it was just perfect! It came together really quickly and my entire family loved it! Winner, Winner delicious dinner!!!! Thank you. Delish! Tons of flavor and one serving is more than enough! Love my WW journey thanks to your recipes! How did you reheat this? Does it microwave ok? Microwave worked fine when we reheated. Emily! This is amazing! This was a huge hit in my household tonight and will definitely make the rotation. Thanks for sharing! I am on weight watchers and was searching for some new recipes. I made this tonight and doubled the recipe since I made it for the whole family. It was DELICIOUS!!! Everyone said it’s a keeper. This will be a regular on the menu. Thank you Emily for a great recipe. This is the first one I’ve tried of yours and can’t wait to try many more! Made this last night for my parents and we all LOVED it. It was delicious!! Thank you for so many wonderful recipes! I saved this recipe from when it was originally posted. I finally made it for our dinner last night. It was VERY delicious. I also liked that the pasta held the sauce. I di8dn’t have any Fresh Spinach on hand, so I used Fresh Kale. We LOVED this dish. It was VERY tasty, and not too difficult to prepare. I made this tonight for my family & they loved it! Very delicious!! We LOVE this! Do you think I could make this into a freezer meal somehow? This sounds great! I am assuming that the 2 tbls basil means fresh basil? Would it be OK to sub 2 tsp dried basil instead and have the flavor be the same? Thanks! Sure! I’ve never made that sub personally so I can’t guarantee the flavor will be the same but I doubt it will be drastically different. Let me know how it works out! Do you think you could sub vottage cheese for the ricotta?? I’ve made this recipe twice – both times very good! The second time I used andouille chicken sausage and penne noodles because that’s what I had at home. I’ve also frozen this before in single serving Tupperware and it thaws very easily! This was a perfect recipe to use what we already had! We used bowtie pasta, and substituted cottage cheese for ricotta, added a smidge of herbed goat cheese and parmesan. I wish I had the fresh basil, but we made do with dried. Thank you Emily for a fantastic dinner idea! It was a hit with hubby and 7yr old!